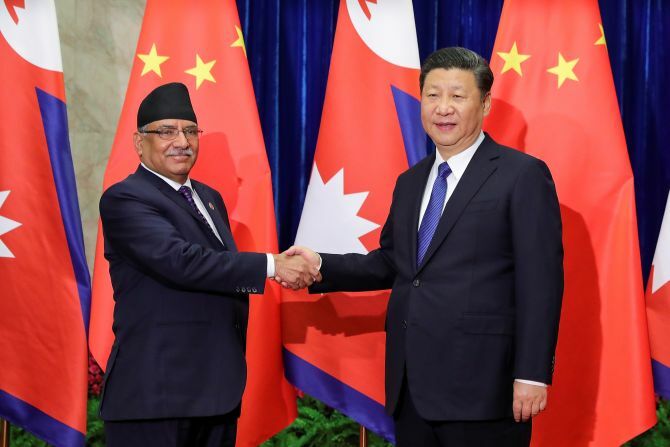 Nepal on Friday inked a deal with China to join Chinese President Xi Jinping’s ambitious ‘One Belt One Road’ initiative to link Asia with Europe, a move that may worry India. The decision to sign the agreement comes ahead the OBOR forum in Beijing on May 14 and 15. Chinese Ambassador to Nepal Yu Hong and Nepal’s Foreign Secretary Shankar Bairagi signed a memorandum of understanding at the Ministry of Foreign Affairs in Singhadurbar, Kathmandu. Deputy Prime Minister and Minister of Finance Krishna Bahadur Mahara and Minister for Foreign Affairs Prakash Sharan Mahat were present during the signing ceremony. “The MoU is an important moment in the bilateral relation between the two countries. Roads and railways connectivity is important for us and we want investment in this sector,” Mahat said. Yu said that the Belt and Road initiative will bring new opportunities for China-Nepal cooperation and South Asia’s development. “To promote Belt and Road initiative, we are committed to the principles of extensive consultation, joint contribution and shared benefits. Openness, inclusiveness and mutual benefit are the defining features of the initiative. The Initiative is not only open to the countries in the region, but also open to the countries outside the region who are interested in it,” said Yu. The OBOR aims to enhance connectivity and cooperation among countries, primarily between China and the rest of Asia and Europe through land as well as maritime routes. China had sent a draft proposal on OBOR to Nepal late last year. After a month-long consultation, the Nepalese side had sent back the draft to Beijing with some changes. Nepal signing the deal with China may cause concerns in India, which has opposed Beijing’s initiative. India has reservations over the China-Pakistan Economic Corridor, part of the OBOR, as it is proposed to pass through the Pakistan-occupied Kashmir. India, which has traditionally enjoyed great economic and political ties with Nepal, has faced increasing competition from China in recent years. Landlocked Nepal relies heavily on imports from India and completely on Indian ports for sea access.